The October Purchasing Managers’s Index from the manufacturing segment (PMI) dropped to 52.5 points from 53.4 in September. This was in line with the market consensus and followed a similar pattern to PMI surveys in the eurozone and Germany. According to Markit, the October decline was driven by a weaker rise in new orders, while output itself remained at the September level. Respondents are worried by trade wars and a deceleration in the automotive segment, which was behind the weakness in new orders. As such, optimism among respondents dropped to a five-year low in October. Employment increased at a slower rate but shortages in the skilled workforce are still present. Input costs continue to grow due to higher prices for raw materials, and output prices increased, partially due to capacity shortages. The situation in industry has been deteriorating gradually this year as a result of trade wars, weaker growth abroad and a slowdown in the car segment. The situation was even worse in the second half of 2016 and PMIs turned positive again in 2017 but manufacturers are now being affected by uncertainties relating to the trade conflict, not just declining output. Also, the car segment has been hit by new emissions standards. Sales of new cars have been hindered since new EU rules kicked in in September. This could partially explain the weaker demand from the automotive sector in recent months. Still, weaker growth in industry was expected this year, falling to around 3% year-on-year after 6.5% growth in 2017, and new orders suggest the situation will hardly get any better next year. 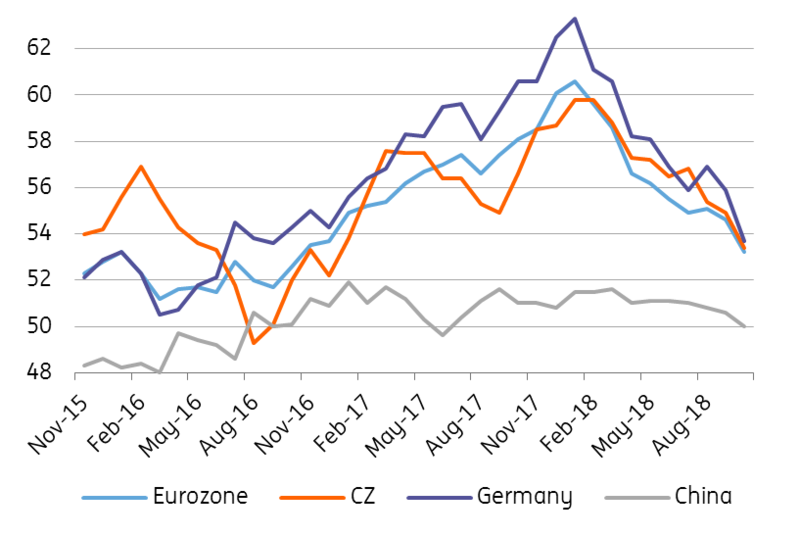 This means that the main growth engine of the Czech economy will move from industry to services this year, as figures from 1H18 suggest.